A wonderful, simple way to make a pork roast very special. I was visiting my mother recently. 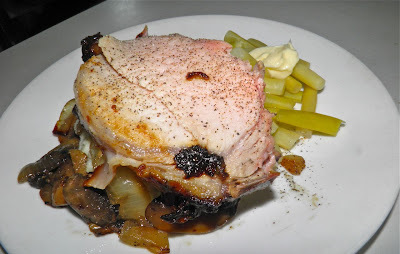 I try to take some food down so I can cook for her, but this time she had already bought a pork roast to make. So I had to improvise on the spot. I value the time I get to spend with my mother. She has done, and still does, so much for me. She’s a very special woman. I try (at the least) to cook dinner so she can relax. Mom has a large sage bush growing among her flowers. That’s a good thing. It’s winter hardy in Nova Scotia and can grow to spectacular size. The bad thing is she doesn’t really know how to use it. You have to understand she’s of a generation where herbs were not all that common to grow yourself. Or to use either, except for some real standards. So out I marched to the sage bush. It only took three snips. The other ingredients are pretty much pantry standards. Onions, mushrooms, mustard and honey. And a little wine, of course. The "magic" lies in what you do with what you have on hand. Another bit is using a meat thermometer. It's the "magic wand" of roasting. Many have said we eat with our eyes first, and I’m a firm believer in that adage. A little presentation goes a long way. Just because it was just the two of us was no reason to skimp on that important part of the dining experience. Even that was simple. Buttery mashed potatoes had a layer of fried onions and mushrooms, and then that was topped with a generous slice of roast. You really should try this recipe. With just a few simple ingredients you can transform what could be a boring piece of meat into something special. A simple wet rub of mustard, honey and sage. 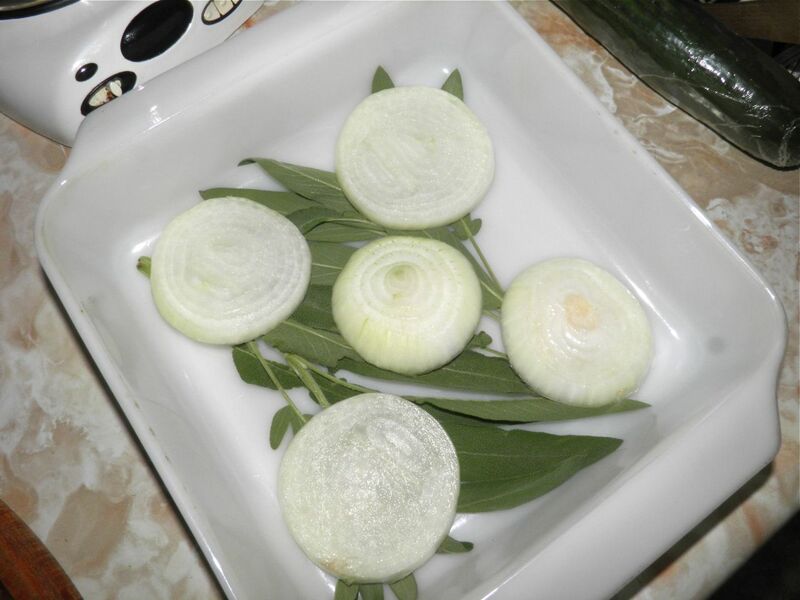 Place the stalks of sage in a 9x9 baking dish. Place the onion slices on top and then the sliced mushrooms. Sprinkle with a little salt. Mix together the mustard, honey, sage and pepper into a loose paste. 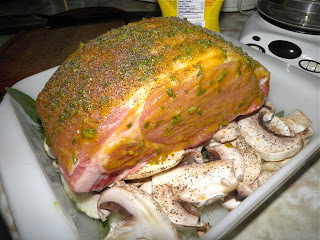 Rub the top and sides of the roast. roast, they are pan fried. 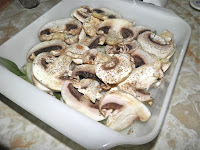 Place the roast on top of the mushrooms in the dish and sprinkle with some salt. Pour the white wine into the bottom of the dish. Bake for 1 hour in the low oven. Then turn up the heat to 450°F and roast for another 45 minutes to 1 hour, or until the internal temperature reaches between 165°F and 170°F. The blast of heat keeps the moisture inside and forms a bit of crust on top. Remove the roast from the oven and let it rest. 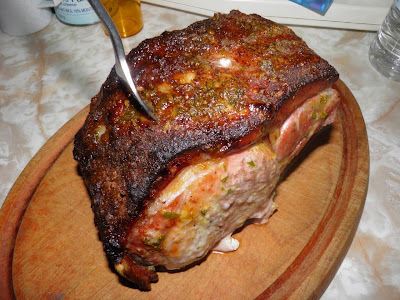 This resting redistributes the juices throughout the meat. It’s an important step. Melt the butter in a frying pan. Remove the sage from the onion.mushroom mixture and place, with whatever liquid, in the pan. Sauté until the liquid has evaporated and the mushrooms and onions begin to brown, about 5-8 minutes. 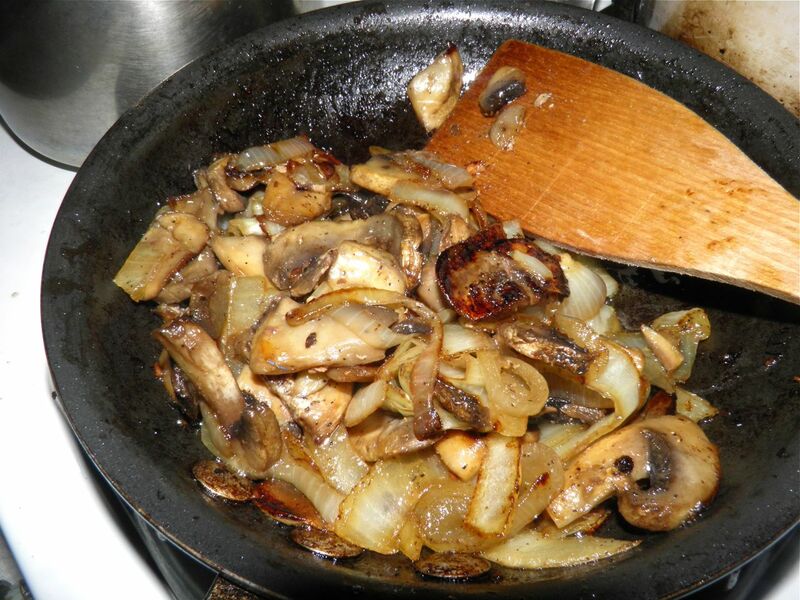 To serve, place the onions and mushrooms on top of buttered mashed potatoes. Place a slice of rot on top. Serve your choice of buttered vegetables as a side dish. We had beans. Resting the meat helps the juices redistribute so they don't run out when you slice.